Slice ½ cucumber lengthways, deseed and cut into strips. Shred 4 salad onions. Heat 1 tbsp oil in a wok or deep-sided frying pan, add 180g pack Cooks’ Ingredients Shredded Free Range Duck and stir-fry over a high heat for 1–2 minutes or until the duck is heated through. Warm a pack of 10 Waitrose Chinese Pancakes according to instructions. 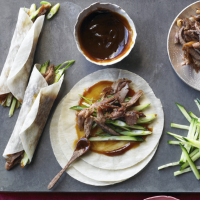 To serve, spread each pancake with a little Cooks’ Ingredients Hoisin Sauce, add a little shredded duck, salad onion and cucumber, roll up and eat with your fingers. Serve with Waitrose Oriental Nanjing Rice Salad (from the chiller). This recipe was first published in Thu Dec 09 16:30:58 GMT 2010.